14k Yellow or 14k White Gold. 3.50 Carat TW Princess Russian Cubic Zirconia's. 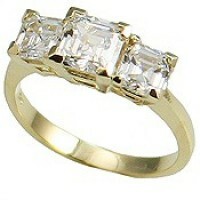 Featuring 2ct center with 0.75ct size stones. Gorgeous, Top Quality Rings, Russian CZs!!! Nice traditional style ring. VERY HEAVY RING!